Shilpa Shetty wore a metallic Silver Off Shoulder Top showing her bare shoulders along with a ivory colored Saree embellished with silver thread embroidery and zari work designed by Manish Malhotra. The leggy lass of bollywood wore a Red Ruby necklace set and kept her hair open aprted from the middle. Kangana Ranaut was seen off late in et‪hnic wear in a Indian see through Saree with floral print and a sky blue strap backless blouse. She was all set for promoting her movie Rangoon wearing a Pearl Necklace and short curly hairstyle. Rekha is one of a beautiful actress in Bollywood, who always love to be in Fashion and she was captured on Camera during the 13th Dubai International Film Festival on the red carpet. 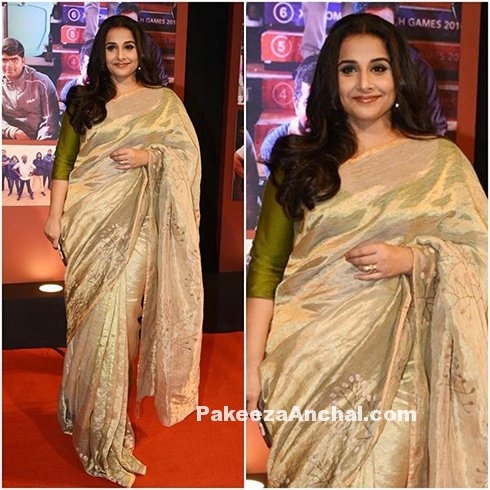 She wore a Golden Silk Saree at the Jumeriah. Disha Patani was always seen in Western dresses exposing her long legs. She worked in few Bollywood & Tollywood movies till date and now can be seen in Ethnic Wear dresses for the Photoshoot of Hi! Blitz magazine. Disha Patani Pictures in Saree and Fishcut Lehenga. For those who don’t know who Nora Fatehi is. Here is her introduction. Nora Fatehi is a Morrocon Canadian Dancer, Actress and model. She worked in movies like Baahubali: The Beginning, Roar, Mr. X, Rocky Handsome and Crazy Cukkad Family and was also a part of Bigg Boss 9 contestant. You can see Nora Fatehi pictures at Yuvraj Singh & Hazel Keech Wedding. Nora Fatehi in beautiful Peach Pink Transparent Saree and Sheer Blouse designed by Rebecca Dewan. Nora Fatehi in JJ Valaya Golden Designer Lehenga on the red carpet. Choli with a huge plunging line and short sleeves was the attention of the event. Shilpa Shetty looked stunning in this glamorous Saree posing in front of the camera in a Pastel & Blue Saree with golden borders with sleeveless Brassier Blouse designed by Shivan & Narresh. Along with that she wore a Cuff and stylish earrings by Valliyan. Her hairstyle was perfect for the Super Dancer event. Kajal Agarwal was chose to wear a Netted Saree in White embellished with thread work Embroidery across the border. She wore it along with a short sleeves Brocade Blouse with deep neck. She completed her looks with a bindi on her forehead and big jhumkas. Kajal Agarwal captured pictures during an item song from Pakka Local Janatha Garage. She was wearing a Polka dotted black and white short sleeved blouse with plunging neckline and a mirror work Black Saree. The Saree was tied in such a way that just looked like a Dhoti Saree. Kajal Agarwal also wore a choker to complete her look. Shriya Saran chose to wear a Orange Lehenga Saree embellished with embroidery and Gota work along with Brassier type sleeveless Blouse for Anam Mirza’s Wedding Reception. She kept her hair sideways with small silver bindi on her forehead and minimal jewelry for the event.